I have become a huge fan of bliss balls in recent months. I love that I can whip up something so tasty, filling and nutritious and just have it stashed in the freezer to grab whenever I want. Life has become extra busy since Oscar started school and most days I don't have time to eat a proper breakfast before we leave. But there is always time to eat a bliss ball or 2 on the run which keeps me going until we get home and I can take a few minutes to sit down and eat properly. Not exactly ideal when you are breastfeeding but it's certainly better than nothing! I have made literally dozens of types recently but this one was especially delicious and both the boys love them too. Bliss ball recipes are very forgiving so if you don't have a particular ingredient you can easily substitute for something else eg, honey for the rice malt syrup, peanut butter for tahini etc. Place all the dry ingredients into the food processor and blitz to a fine crumb. Add the remaining ingredients and process until it comes together in a sticky ball. If the mixture is too dry you can add some extra syrup or a splash of rice milk. 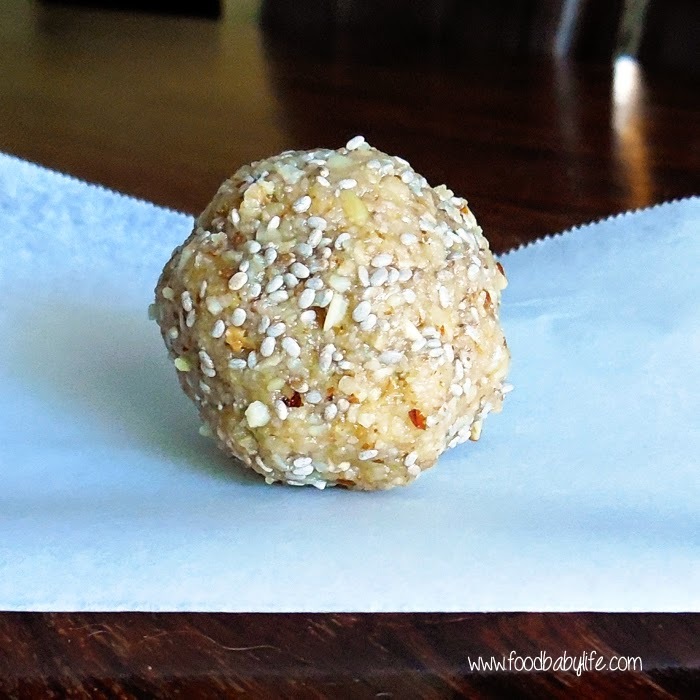 Roll tablespoons of mixture into balls and store in the fridge or freezer. Makes approx 20.